Showcasing their talents this year on FTC StageOne are Irena Hart, Victoria June (Untouchablzz), Bubba Ericson, Glenn Behrle, John Jarvis, Chris Rocket and some surprise guests. The event will be MC by Brett Aaron and Dorota Trojak. Doors open at 6pm with a reception, followed by live music from 7:30 pm to 10:00 pm. All proceeds will be donated to the charity. 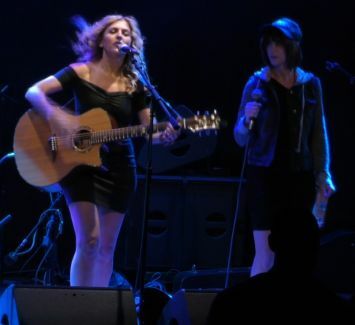 UNTOUCHABLZZ – AN ORIGINAL DUO, WHOSE VOCAL HARMONIES AND CLASSIC FOLK-INFUSED SONGWRITING TAKE INFLUENCE FROM THE LIKES OF Fleetwood Mac, Lucinda Williams, Jewel, The Dixie Chicks and Emmylou Harris. About Irena Hart Irena Hart is a Ukrainian born acoustic guitarist, singer/songwriter, poet and activist. Combine the likes of Jewel, Emmylou Harris and Lucinda Williams, add a quirky personality, then apply a European perspective mixed with an American sense of humor…and you get Irena Hart. Hart delivers a powerful, folk-infused organic sound that captivates her audiences. Several of Hart's original songs have been featured on USA Network’s Burn Notice and CW's Fly Girls. For more information regarding Harmony4Kidz, visit www.harmony4kidz.org or call Irena Hart at 203-209-2779.